For well over 100 years, college football fans have gathered on campuses across the nation to cheer for their favorite team. During the past twenty-five years, cable television has promoted a 12-hour marathon of pigskin glory on Saturdays. Now is the time for college enthusiasts to get off the sidelines and play college fantasy football: It is a game-changing experience. In order to assist college fans to navigate the CFB universe, I have published this article for the past two summers, and there have been hits and misses. Last year, I appealed to readers to draft QB Mitch Trubisky, QB Jake Browning, RB Marlon Mack and RB Joe Williams, and in 2015, I highlighted QB Zach Terrell, QB Greg Ward, Jr., QB Dane Evans, RB Brian Hill, WR James Washington and WR Dom Williams. For your perusal, I have listed ten tremendous under-valued performers to target in drafts this summer. Enjoy and good luck drafting my fellow diehards. A three-star recruit in high school, J’Mar Smith was the top-ranked quarterback prospect in Mississippi by Scout in 2015. At Louisiana Tech, Smith is a two-sport athlete who also plays outfield for the baseball team. He started the opener against Arkansas and played in seven games last year. For the season, he completed 30 of 43 passes for 412 yards and two touchdowns, rushed for 62 yards and scored twice on the ground. At 6’1” and 222 pounds, the redshirt sophomore is a dual-threat quarterback with very good arm strength and is accurate throwing on the run. While taking summer courses, he participated in 7-on-7 drills and assumed a leadership position on the team. After receivers Carlos Henderson and Trent Taylor graduated, Smith has a huge challenge ahead with a new crop of wide outs. During each of the last three campaigns, coach Skip Holtz has started a new competitor at field general, and despite the turnover, the Bulldogs earned a bowl game invitation. Smith is the next man up, and he will keep the offense flying for college fantasy footballers. Last August, quarterback Thomas Sirk—the expected Blue Devils starter—suffered an Achilles’ tendon tear, and coach David Cutcliffe inserted Daniel Jones into the starting lineup. After a slow start, the redshirt sophomore performed much better during the second half of the campaign. When the crusade ended, Jones completed over 62% of passes for 2,836 yards and tossed 16 touchdowns. He posted a 126.28 passing-efficiency rating and added 486 yards rushing, averaging 40.5 yards per game, and scored seven touchdowns. The 6’5”, 215-pounder led the Blue Devils to victories over Notre Dame and North Carolina, and opens the 2017 season as the ACC Coastal Division’s top returning signal caller. Jones owns an active streak of 173 pass attempts without an interception and is a candidate for the Davey O’Brien Award, Manning Award and Maxwell Award. Without question, Jones will become a weekly starter in CFB leagues. 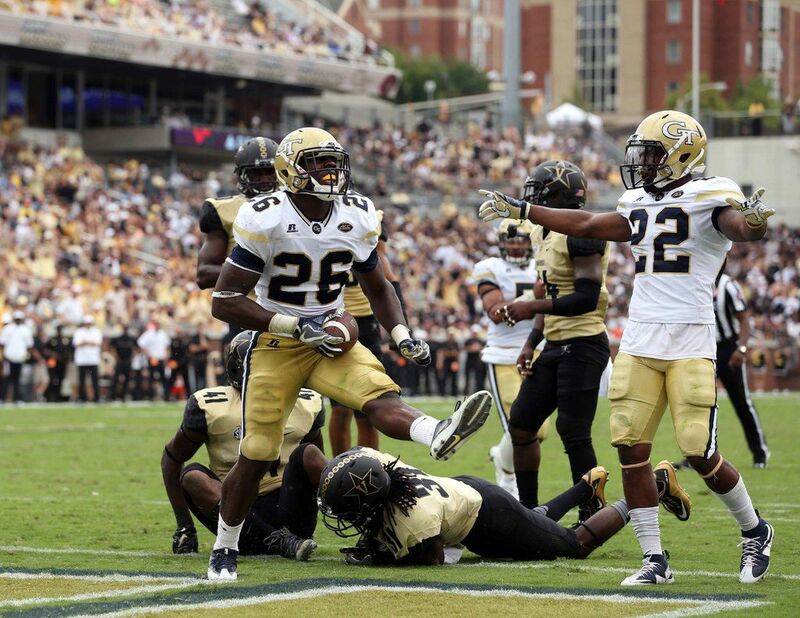 In coach Paul Johnson’s triple-option offense, the B-back is one of the most important positions on the field, and Dedrick Mills starts in the idyllic spot for the Yellow Jackets this season. In 2016, he appeared in nine games and started seven and led the club in rushing with 771 yards and 13 total touchdowns. In eight games, the true freshman scored at least one touchdown and was a two-time recipient of the ACC co-Rookie of the Week: vs. Vanderbilt and Miami. Mills finished the crusade with 31 carries for 169 yards and a touchdown against Kentucky in the TaxSlayer Bowl. At 5’10” and 227 pounds, the sophomore is a stout and physical runner who punishes opponents and runs well between the tackles. Mills has been named to the Maxwell Award list, and CFB fanatics can look forward to a productive campaign from the Georgia Tech bulldozer. Notre Dame endured its worst season (4-8) under coach Brian Kelly, who took over the team in 2010. Upset with the lack of victories, Kelly changed offensive coordinators, hiring 34-year old Chip Long, who inherits four returning starters along the offensive line, including two possible first-round drafts picks in 2018. If the Irish want to return to national prominence, Long must rely on the running game behind Josh Adams and the O-line. As a freshman in 2015, Adams established a school record with 835 yards rushing, and in two seasons, he has totaled 1,748 yards rushing, averaged 6.4 yards per carry (ypc. ), and scored 11 touchdowns. Last year, he received 20 carries only once and averaged a paltry 14.9 touches a game. To conclude the season, Adams surpassed 100 yards rushing in back-to-back games against Virginia Tech and USC. At 6’2” and 220 pounds, the game breaker possesses the skills to become the workhorse in the backfield. Adams was named to the Maxwell Award watch list, and the Golden Dome faithful expect a huge crusade from the junior ball carrier. It is not often that a running back averages over nine yards per carry, and when a player does, college football fanatics must take notice. Ty Johnson hauled the leather only 110 times last year and eclipsed the 1,000-yard barrier, rushing for 1,004 yards and scoring seven times. Posting a 9.1 ypc., he broke a 55-year old school record, and recorded nine plays over 40 yards. Johnson also topped 100 yards five times, including a career-high 204 yards against Purdue. The Terrapins finished the season 6-7, and if coach D.J. Durkin wants to improve in the Big Ten standings, he must get the ball into Johnson’s hands more often. The 5’10” and 205 pound speedster is poised for an even bigger campaign, and astute CFB diehards will draft the junior home run hitter. Across campuses, the pass-happy, spread offense has revolutionized college football. Nevertheless, there are a few coaches who turn back the clock and still implement a version of the triple-option attack. Before coach Bob Davies arrived in Albuquerque, the Lobos had won only three games in three years. In five seasons, Davies has led New Mexico to a 27-36 mark and an impressive 9-4 record last year. More remarkably, the Lobos paced the FBS in rushing with 350 yards per game (team total 4,550) and in 10-yard plus runs with 129. Last year, New Mexico produced two 1,000-yard rushers, and after totaling 1,097 yards, junior Tyrone Owens is the leading returning ball carrier. Averaging 8.0 yards per carry, he only lugged the pigskin 137 times and scored seven touchdowns. At 5’9” and 187 pounds, the explosive runner performs behind an offensive line that returns four starters, and in an offense that tilted the scoreboard with 36.7 points per game (23rd in FBS). If Owens harvests a career-high 180 carries, he easily exceeds 1,200 yards rushing in 2017. Central Florida’s WR Tre'Quan Smith is a prime late-round target among shrewd CFB partisans. In 2015, the redshirt junior was named the All-AAC rookie of the year and led the Knights in receiving the past two seasons, totaling 109 catches for 1,577 yards and nine touchdowns. Last year, he eclipsed the 100-yard barrier four times and recorded twelve plays over 20 yards. The Knights offense returns nearly every key performer and should be more productive in coach Scott Frost’s second season at the helm. In 2017, the Auburn coaching staff anticipates the Tigers offense will take flight with Baylor transfer QB Jarrett Stidham assuming the reigns of the attack. In order for Auburn to recapture the magic of the 2013 season (12-2), the young crop of wide receivers must soar to new heights, providing game-breaking plays. It is a crowded group and Nate Craig-Myers, a four-star recruit and sixth-ranked receiver nationally coming out of high school, is the favorite to start at split-end after spring practices. At 6’2” and 208 pounds, the sophomore is poised to make an impact after a disappointing freshman campaign. He only caught four passes for 70 yards and a touchdown. A strong and physical receiver, Craig-Myers is a natural pass catcher with big hands and is elusive in the open field. CFB fans must keep a close eye on the progress of the sophomore throughout training camp. It is a new era in Knoxville, Tennessee after record-setting quarterback Joshua Dobbs and receiver Josh Malone graduated. Coach Butch Jones has guided the Volunteers to back-to-back, nine-win seasons and anticipates the team continuing its recent performance. A four-star recruit, Jauan Jennings played quarterback in high school and converted to wide receiver as a freshman. The 6’3” and 209-pound junior enjoyed a breakout season last year with 40 catches for 580 yards and seven touchdowns. He even completed a touchdown pass and snatched the game-ending catch in the victory over Georgia. Coach Jones believes that Jennings can be a dynamic playmaker and loves his competitive nature and work ethic. The SEC is loaded at wide receiver and most college football admirers overlook Jennings. Do not make the same mistake. The Cowboys lost all-time leading rusher Brian Hill, who departed for the NFL, and graduated receivers Tanner Gentry and Jake Maulhardt, who toped the team in receptions and yards. Coach Craig Bohl can lean on quarterback Josh Allen, who is one of the top NFL prospects in the nation, to sustain an offense that led the Mountain West in scoring. As a high school prospect, C.J. Johnson was a three-star recruit and ranked third overall in Nebraska by Rivals.com. Last year, the redshirt freshman recorded 21 catches for 304 yards and three touchdowns. Against San Diego State late in the season, Johnson scored the game-winning touchdown in the final two minutes. At 6’2” and 190 pounds, the sophomore has good hand-eye coordination and makes difficult catches. CFB devotees can expect a significant uptick in production.